One thing about loving travel is you’re always looking for the next destination. Far flung tropics? Towering fjords? Bustling bazaars and deserts? Count me in. We spend so much time scrolling through flight deals (that can’t just be me…) that it’s easy to miss what’s right under our noses! I figured it was high time to quit doing that…for me, that means getting familiar with things to do in Lansing, Michigan – my current home base! As you guys know, I have given up my somewhat nomadic lifestyle lately in favor of staying in one place: My hometown of Lansing, Michigan. And how have I been dealing with this adjustment from constant travel? By learning to be a tourist in my own town! I can’t tell you how many times I’ve visited a friend in a foreign country or city, and as they give me the tour of their home, they mention they have never actually done the “touristy” things. Grass is always greener on the other side seems quite apt here. Lucky me, a couple weeks ago I went on a press trip with the Greater Lansing Convention & Visitor’s Bureau. They shared with me corners of the city I grew up in that I’d never heard about, or which had popped up over the years. 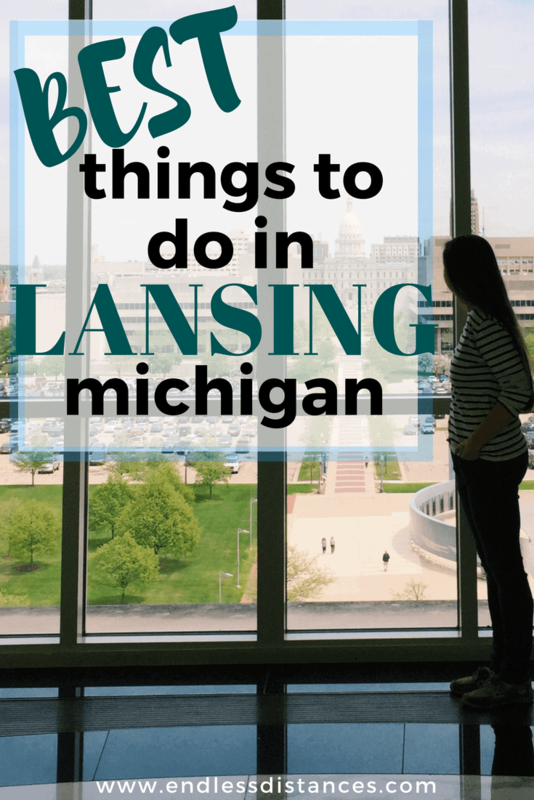 I’m so excited to share the best things to do in Lansing, Michigan with all of you! Honestly, I have discovered so many fabulous and under-the-radar places, events, and things to do in Lansing that it was difficult to compile this list! So I thought we’d narrow it down by choosing the very best. This one has to go to the Capitol in downtown Lansing. The architecture is beautiful and reminds me of Europe. You should definitely take a walk around. A secret tip is the beautiful walking path on the back side of the capitol. For a unique view of the Lansing skyline, head to the Michigan Supreme Courts Learning Centre. On the second floor there is a huge window with a beautiful view. It’s free to enter, and check out the museum while you’re there! View toward Lansing from the second floor of the Michigan Supreme Court building, free to enter for the public! This one is tough because there are two new and fabulous coffee shops in Lansing. They both have these great hipster/millenial aesthetic vibes that make you feel like you’re in a different city (that is, until you realize, hey Lansing is a cool city!!). The first is Blue Owl, which is in Reotown. You can get Nitro coffee here (it’s brewed like beer!). Strange Matter has more of a minimalist feel, with two locations in downtown Lansing. They serve gluten free donuts and I am about that. I love the pottery at Blue Owl! Also the decor… this table was made of a repurposed antique door covered with a sheet of glass. Strange Matter is white with exposed lighting and has that Scandi feel you can only find in… Lansing?! The Broad Art Museum at MSU is a new art museum (since I first left Michigan)… it looks like a spiky space ship, to put it mildly, so you should probably check it out even if you don’t like modern art! They’ve also just opened a new space across the street in East Lansing called the Art Lab. This is a small museum space but also has an emphasis on creation. When we visited we got to create these funky do-it-yourself lithographs. One thing that frustrates me about not just Michigan, but the USA in general is how dependent we are on cars. But while you definitely benefit from having a car to explore Greater Lansing and all the things to do in Lansing… there are also some accessible walking areas! I would recommend taking a stroll through Old Town, which houses many cute boutiques and cafes. Here you can also start on the Lansing River Trail and take a long walk on the boardwalk through Lansing. In downtown Lansing you’ll find the “Big 5“ which are all walkable, and you can make a day of it! In Greater Lansing there is also the beautiful MSU campus (East Lansing), Four Corners (Okemos), or quaint downtown areas of Williamston and Mason. Cute storefronts in Old Town Lansing! Knowing me, of course the hardest of the “best things to do in Lansing” for me to choose is food related… so much so that I am writing a whole gluten free restaurant guide to Lansing, so stay tuned for that. I do love the East Lansing farm-to-table restaurant Red Haven, and associated food truck Purple Carrot (okay, okay I’m biased… I worked here years ago… but they are fab!!). On the press trip I was also introduced to Envie in downtown Lansing, and Tavern 109 in Williamston. Both places served amazing food and I will be sure to return! Okay, you guys know that I don’t drink beer, but I’ve gotta give a shout out to the ever-growing brewery scene in Lansing. Lansing’s brewery scene has exploded over the last few years, yielding award winning brews that put this at the top of the list for things to do in Lansing. Check out the Lansing Brewing Co. in downtown Lansing for great brews and food (I can attest how good the food is!!). They also have events like free 5Ks, yoga in the brewery, hula hooping in the brewery, and more! In Williamston you’ll find Old Nation Brewing Co. which is famous for its hazy brew called M-43. Lansing pride at the Lansing Brewing Co! Cute decor at Old Nation. For a family friendly option, you have to go to a Lansing Lugnuts baseball game at the ballpark in downtown Lansing. On weekends in the summer there are fireworks after the games. There are also a few “dog days of summer” where you can bring your pup with you!! Enjoying a “Marilyn Monroe” cocktail and Pac-Man at The Grid!! The famous Wharton Center at Michigan State University easily takes the cake for best theater in Lansing. You can catch regular Broadway touring shows throughout the year, as well as other performances. I’ve seen anything from Idina Menzel and Wicked here, to Phantom of the Opera, and more. It’s pretty stunning! Okay you may be saying uhhh there is only one zoo in Lansing, but I HAD to add Potter Park Zoo to this best things to do in Lansing list because… it’s just so good! I didn’t realize how lucky I was growing up to have such a great zoo in my hometown, where the animals are rehabilitated and treated humanely. It’s also one of only a few zoos in the world to house Moose. And, there are two wonderful Rhinos who they are currently trying to mate soooo… #LansingBabyRhino2019 ?! You can check here for updated opening times and ticket prices for Potter Park Zoo in Lansing. Patting Doppsee, the 10 year old Rhino, who is a chow hound. I mean Rhino. She reminded me a lot of my new puppy at dinner time?! Feeding willow branches to the appropriately named Willow! Finally, I had to add this because as you all know I am a sucker for anything unusual and quirky when it comes to travel! Well, Lansing does not disappoint in that department. 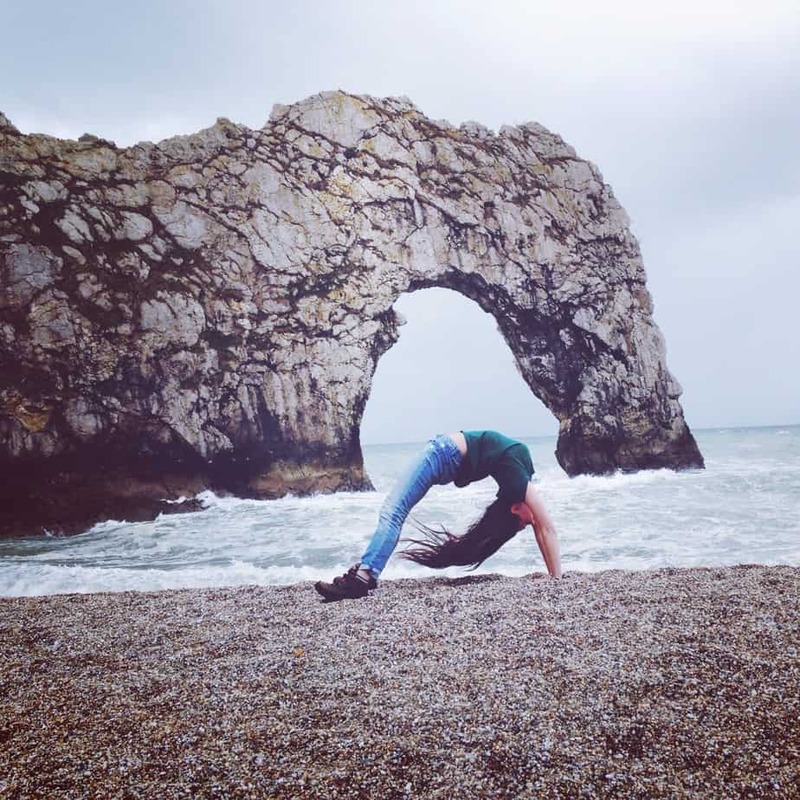 It turns out there is GOAT YOGA (!!) in Williamston, which I will most certainly be checking out ASAP. You can also kayak, canoe and paddle board the Grand River with River Town Adventures, which runs through Lansing. I love being out on the water, and seeing as it is currently over 90F… see you on the water!! I had so much fun exploring my home town through the eyes of a tourist… there are so many things to do in Lansing that are just waiting to be explored. I truly hope this was helpful for anyone either living in Lansing or planning a trip to Michigan! I also want to mention that this coming June 2 is the Lansing ‘Be a Tourist in Your Own Town‘ event. This is an annual event featuring all the amazing things to do in Lansing that are often overlooked because… well, how often do you think of being a tourist in your own town?! You can buy a passport for $1 at various Lansing locations and I hear there is going to be… goat yoga!!! You can find more information about Lansing Be a Tourist in Your Own Town event here, and more information about visiting Lansing here. Have any of you been to Lansing, Michigan before? What about touring your own hometowns? 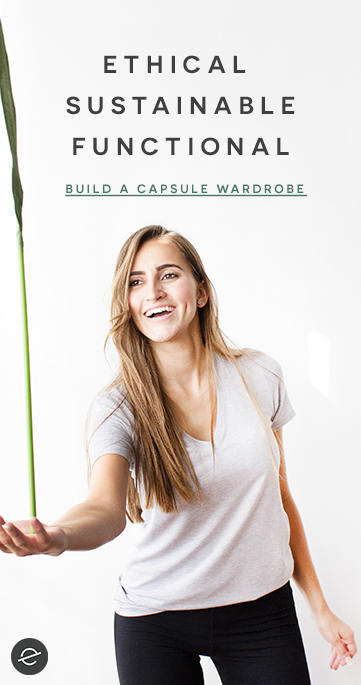 I’d love to hear your stories! *Thank you to the Greater Lansing Convention & Visitor’s Bureau for hosting me on this press trip and introducing me to new locations across Lansing. All opinions remain my own.